At least, in terms of being the foundational looter shooter. Its humor was very of its time. We didn't know how lucky we were. "Hey, that's a decent improvement on the original," we thought back when Borderlands 2 came out in 2012. Great class system. Tons of guns. It was a lot of fun. We didn't realize Borderlands 2 would end up being a framework so many games would build on, and yet fail to live up to. We didn't realize it was quite so special. Borderlands 2 took stuff from MMOs, like color-coded rarity levels and raids, but reduced the boredom of traveling by adding bouncy vehicles right out of Halo. It worked both as a co-op experience for friends who wanted an excuse to hang out online, and a solo game. It had a long tail of DLC, timed events like the $100,000 Loot Hunt, and endgame challenges like Digistruct Peak, as well as Overpower levels for players who'd maxed out everything else. Though it predated "games as a service" it was, in its own way, a forever game. There are still at least 5,000 people playing it at any given time on Steam, even today. At the same time, Borderlands 2 is very 2012. 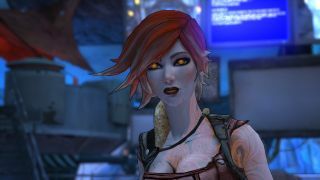 When the siren-class character, Maya, spots an elite enemy she shouts "We got a badass over here!" like the Neil deGrasse Tyson reaction. Axton, the soldier-class character, sometimes says "You get a bullet, and you get a bullet!" like Oprah but for murders. There's a double rainbow easter egg, and the pirate-themed DLC features ninja pirates for god's sake. Borderlands 2 is a museum of memes from the early 2010s. Woah, that's a full rainbow. It's also heavy with pop culture references, but there's a line between the two. The vehicles added in the Captain Scarlett & Her Pirate's Booty DLC are designed to look like the skiff from Return of the Jedi. That's just a reference. When Gaige, the mechromancer-class character, shouts "Unlimited power!" like a million image macros of Palpatine in Revenge of the Sith, that's a meme. Now, several years later, I find the dated-ness of those memes weirdly charming. I haven't heard anyone say "Garbage Day!" or reference trap cards in ages, but here they are in Borderlands 2, frozen in meme amber. It wasn't all memes, of course. We wouldn't have cared about departing NPCs saying "I must go, my people need me" if they weren't in a game that kept us around with an eternal cascade of sweet loot. The sniper rifle that shoots acid bullets in three-round bursts when zoomed. The pistol that reloads almost instantly and is stable as a rock. Those kept us playing through True Vault Hunter difficulty, through multiple DLC packs, across hundreds of hours. Play a loot game for that long and builds inevitably degenerate. One example of that was The Bee, a shield with a decent chance of dropping from a propaganda radio host in the Boneyard area of the Arid Nexus. Named for Muhammad Ali's famous quote (a reference, not a meme), The Bee gave bonus damage per shot and was massively overpowered if combined with guns that had a high rate of fire. Which is what everyone did once they figured out how to farm it. Borderlands developers Gearbox treated the exploit like an MMO developer would and nerfed it, rather than just letting it slide like devs might in a more typical first-person shooter that wasn't meant to be played for years. While Borderlands 2 is definitely an FPS, judging it by those standards misses its appeal. Its enemies possess only rudimentary tactics, throwing grenades at players behind cover but otherwise not doing much to coordinate. The spaces you fight them in are deliberately samey, with exploding barrels keyed to different elemental damage types placed throughout every bandit stronghold. The point isn't to outsmart the AI, but to transform your character into an effective mathematical engine to munch them with. Shielded enemies are susceptible to electrical attacks, while armored enemies can be melted by corrosive ones. Fire attacks are best against enemies who have no special defences but plenty of regular health, and Borderlands 2 has no shortage of meaty bullet sponges. Anyone who takes damage from slag will take bonus damage from any non-slag attack that follows. Juggling all these things, working with other players or swapping between guns, grenades, and powers with different damage types, it can feel more like playing Final Fantasy or Pokemon than Half-Life. "Maya uses pistol that shoots rockets. It's super-effective!" (That's both a meme and a reference for you). That is a 40K boltgun, yes. Which is not to say that it's bad at being a shooter. Borderlands 2 doesn't do the RPG thing of having the numbers invalidate your ability to aim. If you land a shot on someone it doesn't matter what your gun's stats are, you landed that shot. Enemies take bonus damage if you hit them where they're weakest, and goliaths will frenzy and attack their allies if you pop off their dopey bucket heads. The expectations of FPS players are catered to, with the dopamine hit of RPG progression layered on top. Other looter shooters are still struggling to recreate what Borderlands 2 did right. The Division games have boring loot, all kneepads and guns that don't even explode like grenades when thrown. Warframe's a completely different game for its opening hours before it gets good, and Anthem never does. Destiny's NPCs keep obnoxiously trying to remind you of their personalities every time they pop up, but most of them are forgettable. The Ghost is just Claptrap for boring people. The Gearbox of today isn't the Gearbox of 2012, however. Borderlands 2's lead writer, Anthony Burch, is not writing Borderlands 3. The second game's creative director, Mikey Neumann, has also left the studio (though he did come back to help make Borderlands 3's trailer). And between the release of Borderlands 2 and now Gearbox has been responsible for Aliens: Colonial Marines and Battleborn. It's tempting to lower our expectations a little. That trailer really does look like classic flavor Borderlands, though. Some have expressed disappointment with that familiarity, but a game that sticks to the template would be preferable to one that's beholden to all the worst trends of modern looter shooters. A Borderlands game with battle passes, microtransactions, and a confusing variety of different currencies? No, thanks. I'd rather they stick to their guns. And what about the memes? What's 2019 got to contribute—jokes about whether unused items in your inventory "spark joy"? Bandits impersonating Powerful Shaggy instead of quoting Hamlet? I wrote that as a joke but now I think about it, that would rule. Still, memes aren't the same carefree internet japes they were when Borderlands 2 came out and the idea of someone at Gearbox having to sift out the ones that have been appropriated by bigots is a depressing thought. When Borderlands 2 was new I played it with friends. We had a blast, and to my surprise I realized I was interested in the story, not just the shooting. I made a second character just to go through it solo, hunting down audio logs and hanging on Handsome Jack's every word. That's what stands out when I compare it to the looter shooters that followed. I can't imagine doing the same thing in The Division 2, a game where even fans don't care about the plot. If Borderlands 2 did adopt some of the trappings of modern looter-shooters I wouldn't mind too much, so long as it kept the idea that it's worth having an arc, a villain you love to hate and a plot that feels like it's building to something. Also the song that plays over the opening credits has to rule, but that's a given.